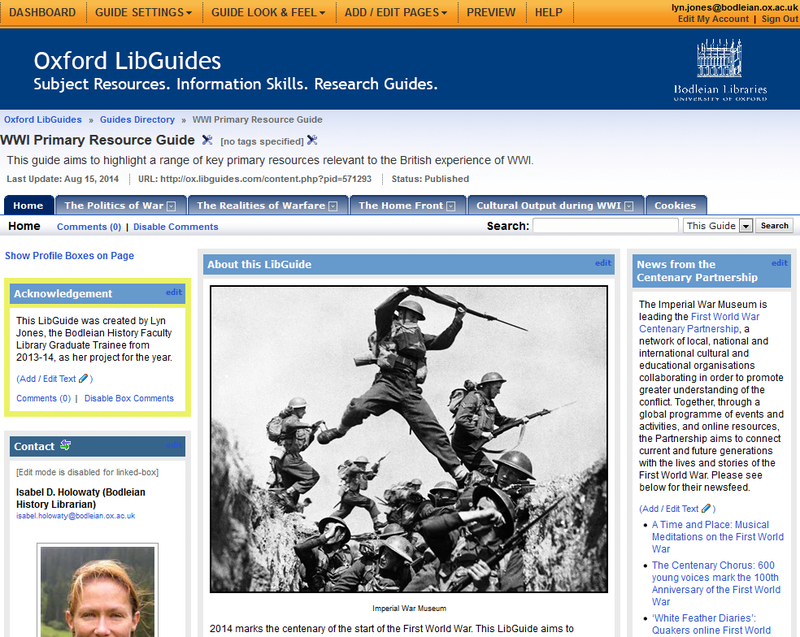 Readers are alerted to a newly created LibGuide, which seeks to highlight a range of primary resources pertinent to the British experience of WWI, pointing users towards key libraries, archives and databases. The resources featured, both printed and electronic, are organised thematically, with a variety of topics covered and a series of illustrative examples provided. 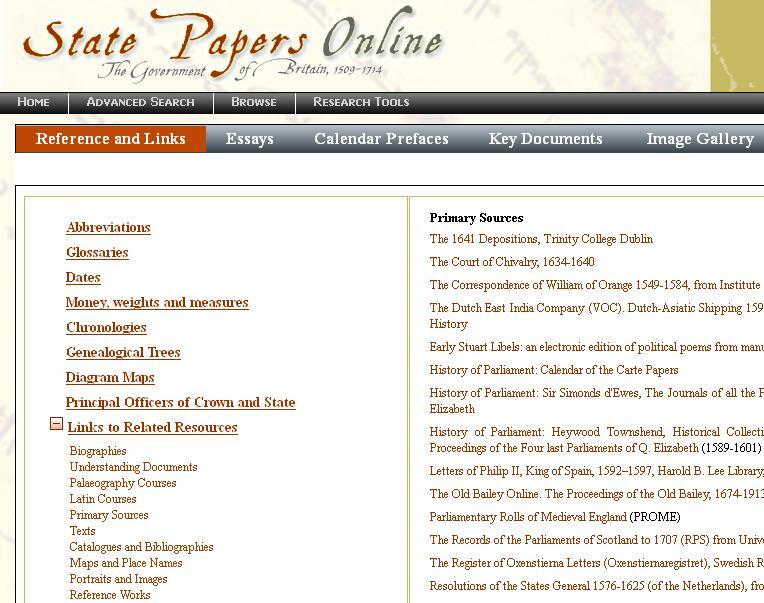 Multiple source types are explored, including: maps, official papers, newspapers, diaries and journals, literature, music, posters, cartoons and government reports, many of which have been digitised. Attention has also been drawn to resources available locally, including several which are held within the Bodleian collections. During Week 3 Bodleian Libraries will be a hosting a series of WISER events designed to help Oxford historians get the most out of the resources available to them. Sessions will provide useful tips and demonstrations, offering students and researchers opportunities to explore sources including ebooks, bibliographical databases, key online collections and web portals. 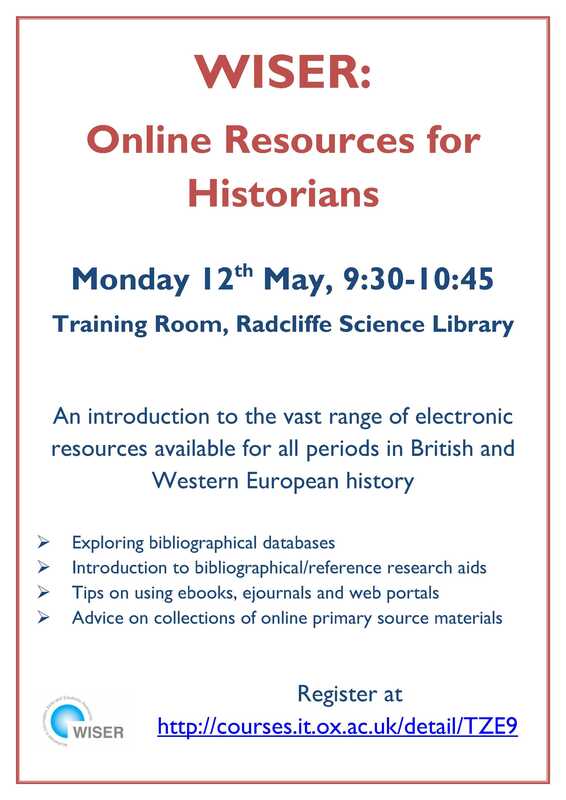 On Monday 12th May, ‘Online Resources for Historians‘ will offer a general introduction to the vast range of electronic resources available for all periods of British and Western European history. Aside from an exploration of bibliographical/reference research aids and databases, presenters will provide an insight to ebooks, ejournals, web portals and collections of online primary source materials. Students, researchers and anyone interested in the growing availability of online resources will benefit from this session. Book your place. 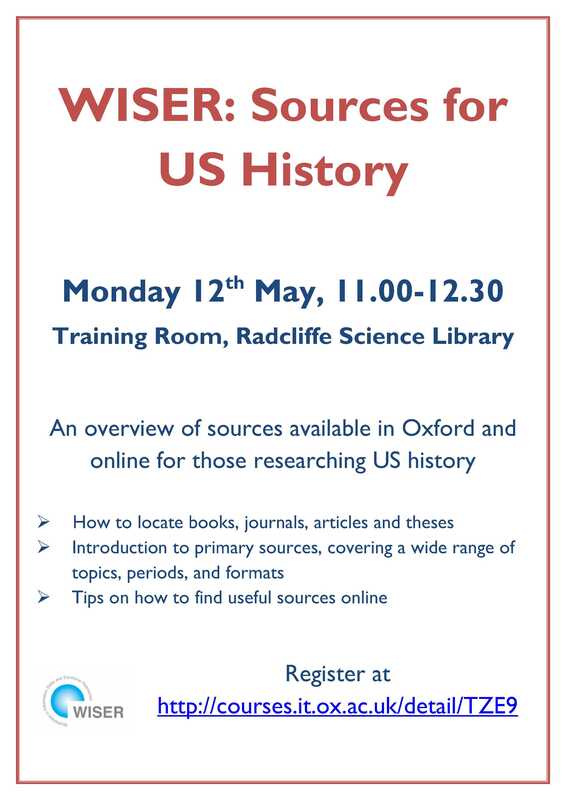 Also on Monday 12th May, ‘Sources for US History‘ will deliver an introduction to key information sources and finding tools for the study of colonial America and US History until 1990. For further details on this session, please see earlier blog post, or book your place. 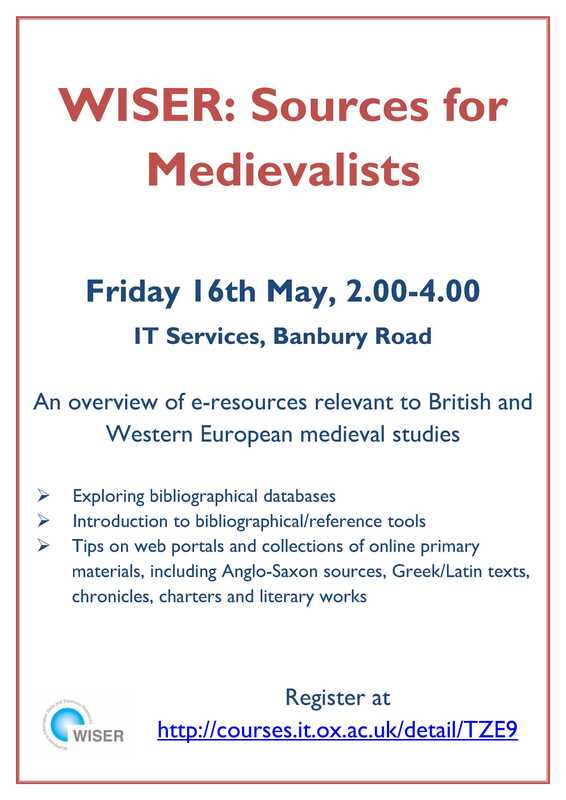 On Friday 16th May, ‘Sources for Medievalists‘ will provide an overview of a range of e-resources relevant to British and Western European medieval studies. The session will include information on bibliographical databases, web portals and collections of online primary source materials including Greek/Latin texts, Anglo-Saxon sources, chronicles, charters and literary works. The material presented will be of use not only to students, but also researchers and academics with an interest in this area. Book your place. If you would like to attend any of these WISER sessions, please book your place using the links provided. For further details, see the posters below. 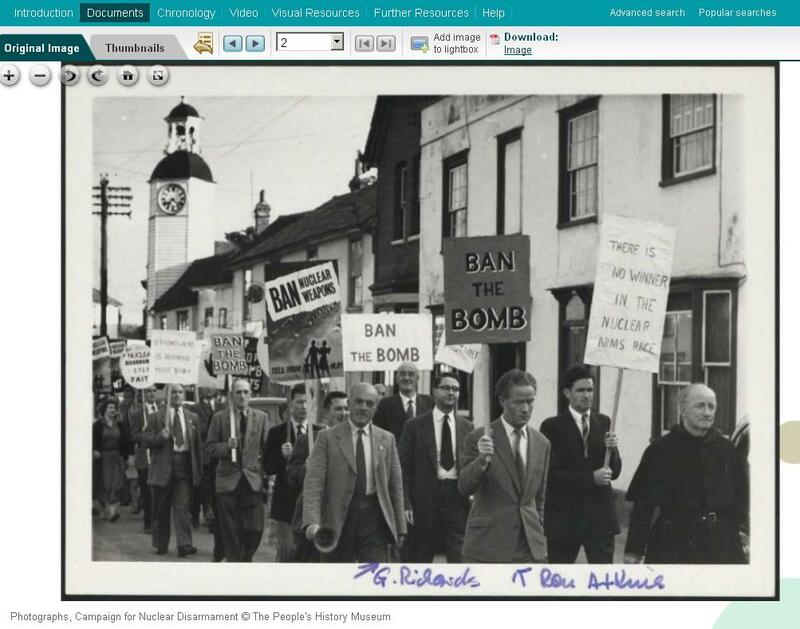 Oxford users are now invited to trial English Historical Documents Online (EHDO). 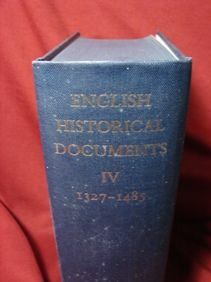 EHDO provides online access to the very well-known English Historical Documents series, essential to historians engaged in the study of British history from the early medieval ages to the 20th century and US history from 1776. The selection of documents includes a wide range of sources, such as government and cabinet proceedings, military dispatches, newspaper articles, pamphlets, personal and official letters and diaries, covering political and constitutional history, religious, cultural and economic history. As well as searching by keyword in the full-text, you can browse by volume (ie by period), but you can also find documents by themes, such as economic history, military history, social history, etc. There is a handy list of abbreviations of sources selected and the editors’ prefaces. The trial ends 4 December. 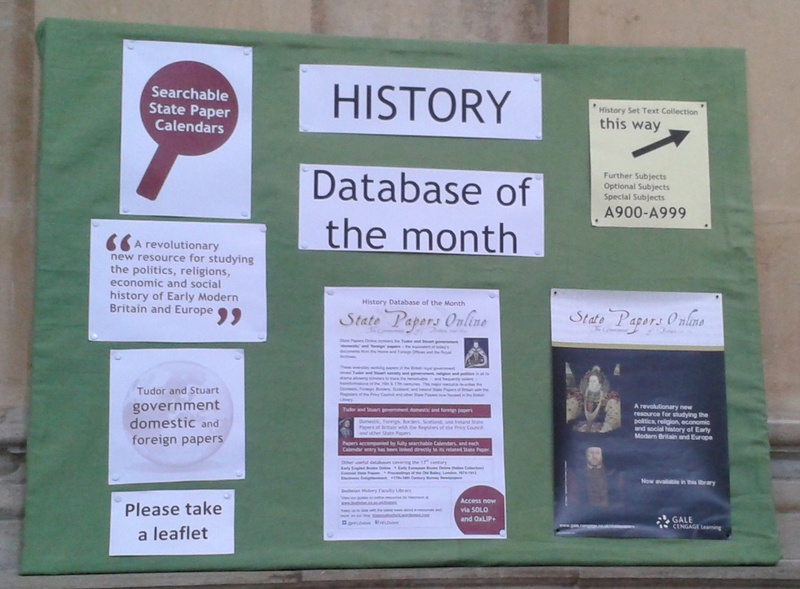 Please send feedback to isabel.holowaty@bodleian.ox.ac.uk or leave comments on the History databases desiderata & trials site. The course examines two major digital image collections subscribed to by the University – ARTstor and Bridgeman Education – and a third resource, free for educational use, VADS. All of these are geared to research and teaching in the humanities, history of science and medicine, and social sciences. Viewing, presenting and managing images are also covered. A briefing on open access for research publications and Oxford’s position: Green vs. Gold; funder mandates and publisher policies; Oxford Research Archive (ORA) and Symplectic; new OA website/ helpline. 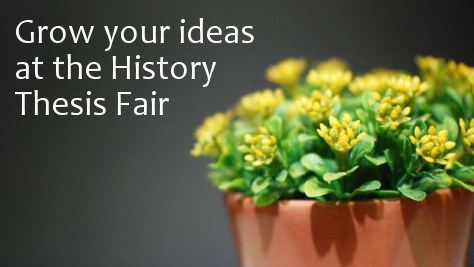 The Thesis Fair is running on Thursday afternoon and is an opportunity to talk to expert librarians, archivists and other subject specialists about how to find resources for your subject. Whether you’re still picking your topic or have already started researching, advice is available on resources, skills training, reference management and tips on how to manage your thesis from a fellow student. This is a drop in session throughout the afternoon, 2.30-4.30pm and no booking is necessary. Three collections of personal papers from the Bodleian Library of Commonwealth and African Studies have recently been catalogued byt the Save Oxford Medicine Project and made available to researchers. The letters, written by British doctors and nurses working in various parts of Africa in the second half of the 20th century, were sent home to family and friends and contain striking first-hand accounts of their lives. 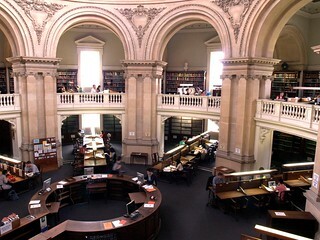 This session will give an introductory overview of the rich heritage collections preserved in the Bodleian. This session will also help readers to locate relevant material and describe the procedures for access and getting assistance. 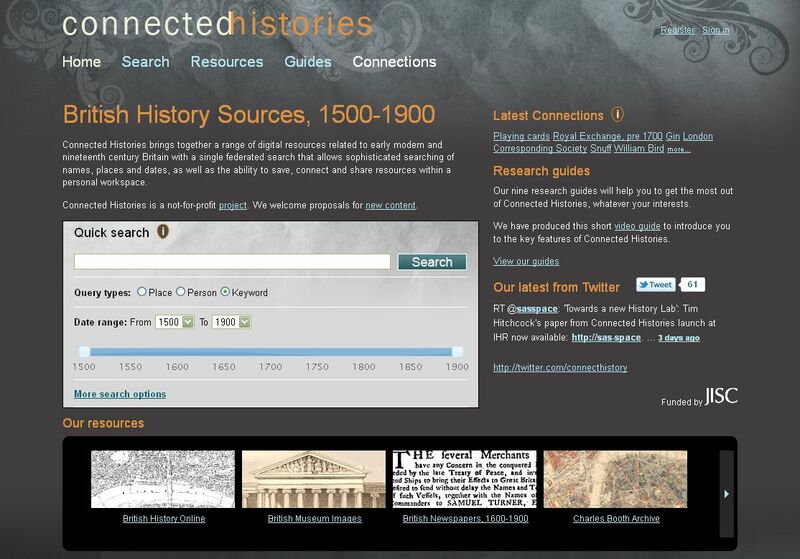 Launched on 1 April Connected Histories: Sources for Building British History, 1500-1900 is a federated search engine to search in a single search a wide range of distributed digital resources relating to early modern and nineteenth-century British history. British History Online: The digital library of primary and secondary sources for the history of Britain, from the Middle Ages to c.1900. British Museum Images: The collection provides searchable access to almost 100,000 images, relating to early modern and 19th-century Britain. British Newspapers, 1600-1900: The most comprehensive digital historic British newspaper archive in existence, with 3 million pages of historic newspapers, newsbooks and ephemera from national and regional papers. Oxford user? Check below for tip how to connect to British Newspapers from Connected Histories. Charles Booth Online Archive: The online archive provides access to guides, digitised images and maps from the Booth archive collections at the London School of Economics and Political Science and the University of London Library. Clergy of the Church of England Database 1540-1835: A database containing details of the careers of more than 130,000 clergymen of the Church of England between 1540 and 1835, from over 50 archives in England and Wales. House of Commons Parliamentary Papers: The Parliamentary Papers gives access to page images and searchable full text for over 200,000 House of Commons sessional papers and supplementary information from 1688 onwards. John Johnson Collection of Printed Ephemera: The collection provides access to more than 67,000 scanned items from the Bodleian Library’s holdings documenting various aspects of everyday life in Britain from the 18th to the early 20th century. Old Bailey Proceedings Online, 1674-1913: The Old Bailey Online contains accounts of the trials conducted at London’s central criminal court between 1674 and 1913; and also the Ordinary’s Accounts – detailed narratives of the lives and deaths of convicts executed at Tyburn, published between 1676 and 1772. London Lives 1600-1800: London Lives provides a fully searchable edition of 240,000 manuscript pages from eight London archives and 15 datasets, giving access to 3.5 million names. Origins Network: Origins.net offers online access to some of the richest ancestral information available. The collection searchable through Connected Histories focuses on the early modern history of London. John Strype’s Survey of London: This is a full-text electronic version of John Strype’s enormous two-volume survey of 1720, complete with its celebrated maps and plates, which depict the prominent buildings, street plans and ward boundaries of the late Stuart capital. Please note that some of the resources searched are free while others require subscriptions. 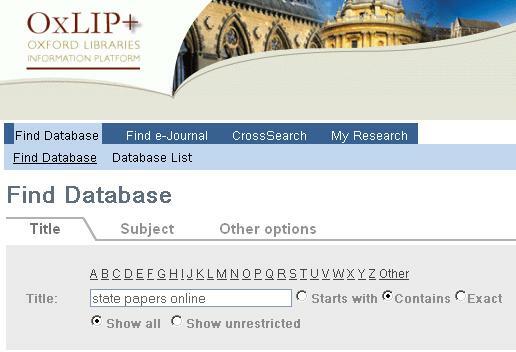 Fortunately Oxford users have access to all resources with the single exception of Origins.net. If you find results from British Newspapers, 1600-1900 (aka 17th and 18th Century Burney Collection), you will be prompted with the UserGroup Identification. Type in oxford to proceed. 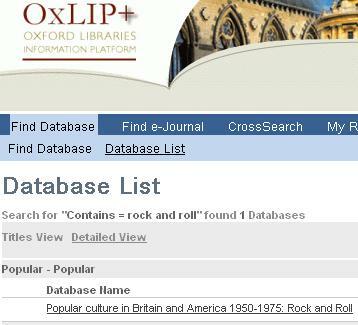 Remote access to Oxford subscription resources works best if you use VPN. A digital edition of the diary of William Godwin (1756-1836). The first entry is for 6 April 1788 and the final entry is for 26 March 1836. The diary is a resource of immense importance to researchers. It maps the radical intellectual and political life of the late 18th and early 19th centuries, as well as providing evidence on publishing relations, conversational coteries, artistic circles, etc. over the same period. One can trace the developing relationships of one of the most important families in British literature, Godwin’s own, which included his wife Mary Wollstonecraft (1759-1797), their daughter Mary Shelley (1797-1851) and his son-in-law Percy Bysshe Shelley (1792-1822). Many of the most important figures in British cultural history feature in its pages, incl. Anna Barbauld, Samuel Taylor Coleridge, Charles James Fox, William Hazlitt, Thomas Holcroft, Elizabeth Inchbald, Charles and Mary Lamb, Mary Robinson, Richard Brinsley Sheridan, William Wordsworth, and many others. The Dutch portal to find all Acts (House Reports, Papers and parliamentary questions) for the years 1814 to 1815 session until January 1, 1995. Includes name index. This Digital Historical Archive of La Stampa contains a copy of the entire newspaper collection. The first issue available is the one of February 9, 1867, when the newspaper was still called Gazzetta Piemontese. The database archive reach the year 2005. All the newspaper pages for a period of 138 years are published not only as images but also as digital texts available for e-text-mining queries. This is true for the more than 12 million articles indexed with the ability to search contents and highlight all keywords within the database. Repertory of German scientific periodicals of the 18th century is an an instrument for research on the history and philosophy of science and technology during the Enlightenment. It contains the table of contents of most 18th century periodicals that published scientific articles and/or reviews in the German speaking countries. These include the (Nova) Acta Eruditorum, and other important periodicals published under the auspices of Academies of Science and early professional journals. A total of over 400 volumes and more than 13.000 articles have been made accessible in this project. Free online access to the history of Germany legislation as published in the Bundesgesetzblatt (Archiv BGBl Teil I und II) and dating from 1949 (1951 for Teil II) to the present.